I love going to museums! I love seeing all kinds of amazing art and artifacts, learning more about an artist or piece of history, and making new discoveries. Unfortunately, even in the museum-rich city where I live, it can be hard to see all the exhibits that come through, or even get to museums due to transportation or high cost (I’m not saying they’re wrong to charge those rates, I’m just saying if many kids had to pay $20 to look at art vs. $13 for a blockbuster film, I can guess which they’d choose). Where I grew up the idea of a museum was a stuffy warehouse filled to the brim with items with minimal labeling and no context. On either end of the spectrum, it can make art and history hard to engage with for many. Now, Google has an app that is trying to address this divide. Google has just unveiled a new app that makes it as easy to find the opening times of your local museum as it is to figure out who painted that bright purple Impressionist masterpiece you saw five years ago at the Louvre. Most teens and young adults have smartphones. This is a great way to bridge that gap between access points and give everyone the ability to geek out over Claude Monet or Alfred Stieglitz, or actually figure out who those two dudes are. Scientific concepts can be hard to grasp without some kind of real world example. So why not make them cute or magical examples? Animator Shuyi Chiou and the folks at CreatureCast give an adorable introduction to the central limit theorem – an important concept in probability theory that can reveal normal distributions i.e. bell curves across data that does not appear to fit a normal distribution curve. Originally created for The New York Times. more via The central limit theorem, explained with bunnies and dragons. You can see the entire CreatureCast series at the New York Times. 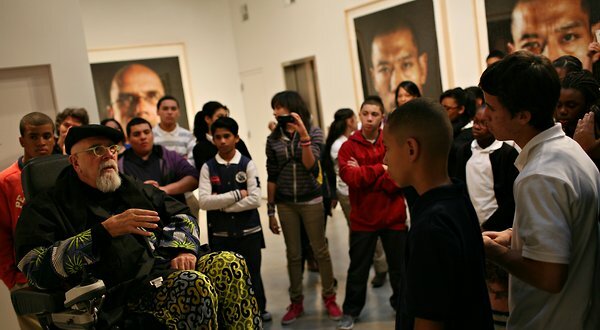 Stationed in front of one of his large self-portraits, the artist Chuck Close raised his customized wheelchair to balance on two wheels, seeming to defy the laws of gravity. The chair’s unlikely gymnastics underlined the points that Mr. Close was making to his audience, 40 seventh and eighth graders from Bridgeport, Conn.: Break the rules and use limitations to your advantage. via Chuck Close Uses Art to Inspire Students to Academic Success – NYTimes.com. Design*Sponge is featuring a very cool book today that contains illustrations from science textbooks and educational charts over the 19th and 20th century, curated specifically for their aesthetic value. I’m 100% certain that if the education charts in my junior high science class looked like those found in this book, I would have gotten a much better grade. A few years ago, I hunted down a chart of sea plants in Paris found at the most magical of natural history stores, Deyrolle. It is still one of my favorite pieces of art. Katrien Van der Schueren, owner of voila! Gallery in Los Angeles, has been collecting educational charts for over a decade. In this volume, Katrien compiled over 100 of these vintage educational posters for the Art of Instruction. The book’s charts cover subjects ranging from the anatomy of a tulip or apple tree to that of a hedgehog or starfish. The book is just now available for pre-order. To celebrate the book’s launch, Katrien is gifting one lucky reader the chart depicted on the book’s cover! To enter, just leave a comment below describing your favorite poster from childhood; it doesn’t have to be an instructional poster. check out closeups and more previews of the book via art of instruction + contest | DesignSponge. more via Why Does Writing Make Us Smarter?. Interesting morsel of news this morning; apparently the U.S. food pyramid is out, and a new food circle or “plate” is in! A colorful four-part plate, with a side dish of dairy, will replace the 19-year-old food pyramid as the icon of the new U.S. Dietary Guidelines. The icon represents more than the currently recommended diet. It’s part of a drastic change. The old plan was to provide information. The new plan is to actively change American eating behavior, using all the tools of modern persuasion. via USDA Ditches Food Pyramid for a Healthy Plate. To me this is an interesting exercise in art as well as science: what is the easiest, clearest way to visually explain nutrition? I’m not sure a pyramid was “confusing” like some of the reports are saying, but I like the idea of using a plate, since it is a lot easier to transpose mentally onto a real plate. How would you like to walk among the stars without ever leaving Earth? Or cavort among the molecules, get close up to cells or rub shoulders with lions, tigers and bears? Museumgoers of the future could do all this — possibly within five years — thanks to cutting-edge technology that offers visitors high-quality “3-D vision” without the usual cumbersome goggles. 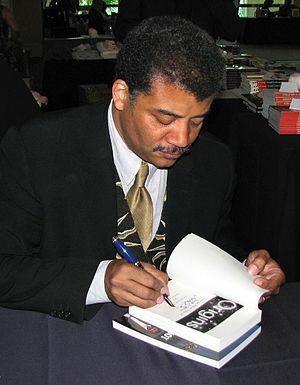 Astrophysicist Neil deGrasse Tyson, director of New York’s Hayden Planetarium, believes such technology, which has the potential to turn an afternoon at the museum into a multisensory, memorable educational event, may be one of the hallmarks of such institutions as they move into 21st century. Tyson, two-time appointee to presidential space commissions, author of nine books and, per People magazine, the sexiest living astrophysicist, will be keynote speaker at Wednesday’s session of the American Association of Museums convention at the George R. Brown Convention Center.